The Loop Santoku is specially designed for all of the times you want to cook a meal but don’t want to pull out the large cutting board. 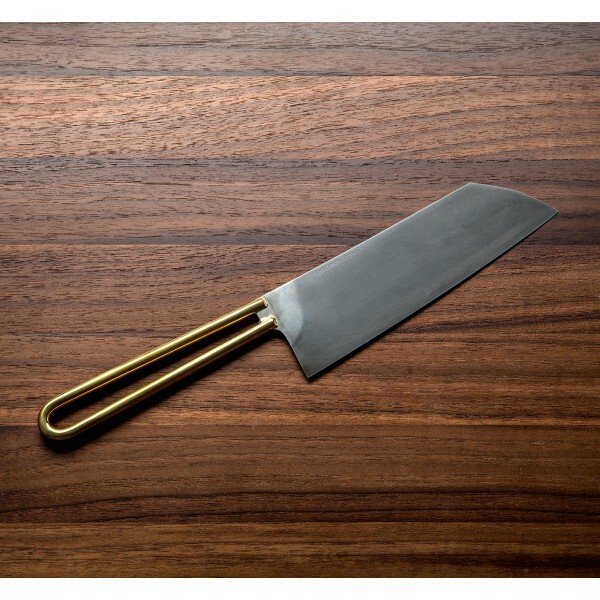 As in the Loop Chef and Loop Paring, the brass handle is modeled after a type of handle used long ago in simple utility knives, this time in a beautifully executed, luxurious package for the kitchen by Andersson Copra. The carbon steel blade and handle are joined together with a hard silver solder, a detail that those who appreciate the craft will love. Hardened to 62 HRC, the Uddeholm UHB-20C blade has a slightly convex grind, a thin edge, and a 50/50 geomentry. 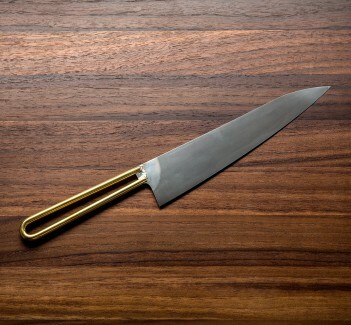 The forced patina and combination of brass and steel give a sharp and modern look. 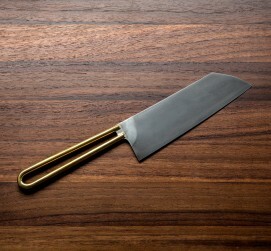 A wooden transport case is included with this handmade knife. 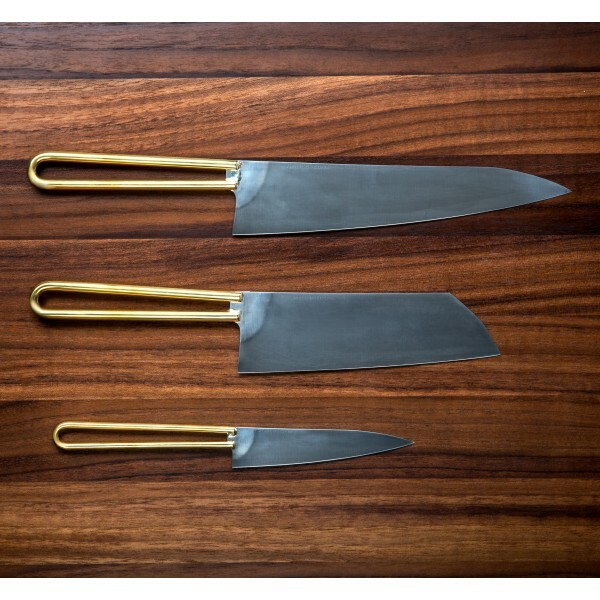 Joel Andersson and Adisa Copra are the couple behind Andersson Copra, making kitchen knives by hand in their Gothenburg, Sweden, studio. 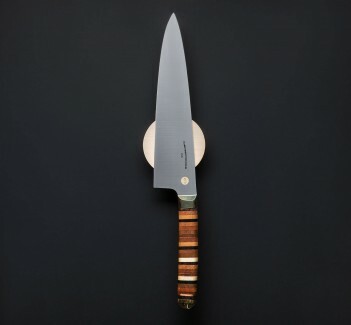 They form each blade on a water-cooled grinder and have fine-tuned a design and approach that result in light and sharp models to make cooking easy and fun. 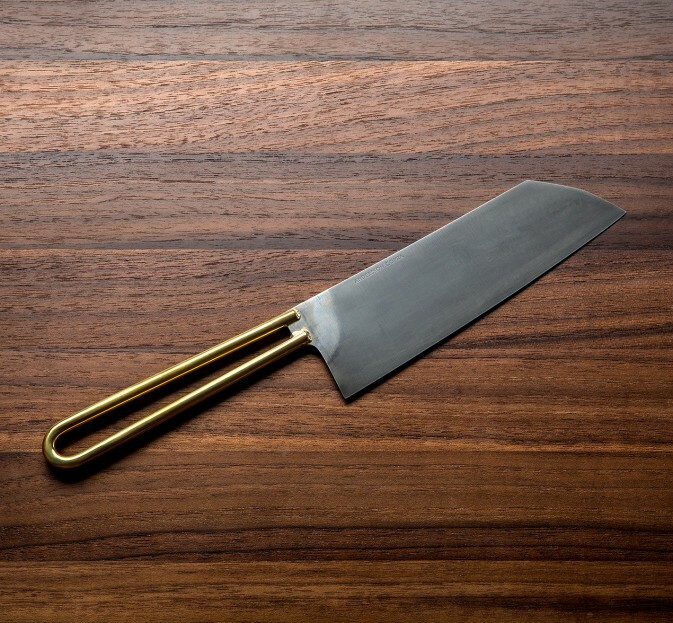 Striving for beauty in simplicity and superb functionality, Joel and Adisa have created the Loop Santoku, a stunning example of their ingenuity and creativity.  Uddeholm UHB-20C carbon steel blade hardened to 62-63 HRC. 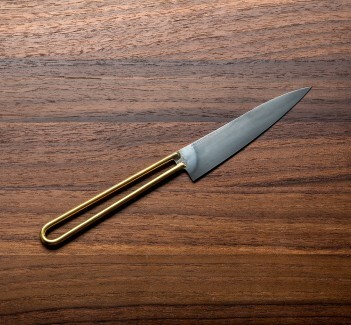 Brass handle with hard silver solder.